Aunty Nellie’s range of cleeves Toffees & Caramels. 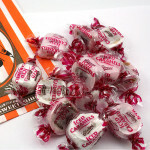 Choose from a range of iced caramels as well as traditional and mint toffees. Buy online or pop in store to find your favourite!